"Great and intuitive tool for Quizz management"
Nothing, I just woud appreciate to have an iSpring Quiz to Excel conversion. Need to create an html file for Quiz, with different questions types : drag and drop, listing etc. PowerPoint to HTML5 conversion is extraordinary. iSpring Suite is, well, a bit pricey for me. I make lessons and quizzes, which I upload to a resource website. So it's a great tool for teachers. "easy and fast to start "
"Legacy presentations to e-course using iSpring"
Using iSpring we do not need to start development of course from scratch. You can use this tool to convert old legacy presentations to e-course. This tool can help even to convert complex presentation by carefully preserving the effects that PowerPoint used into a Flash or HTML5 course. Honestly, I do not have anything to share here at the moment. The of the big challenges for L&D professionals is to create training programs that engages the learner and keeps the learners interest. This tool helped in converting their classroom presentations into the interactive eLearning. There is nothing to dislike or to like least. iSpring suite is a great tool for my team to speed up the productivity. Rapid development leads to higher profit. "Quick and easy to learn and develop eLearning courses"
It is easy for non-programmers to develop eLearning courses. It would be good if it not limited to non-programmers. Need to have option that will help to add custom triggers. Quick PPT to eLearning conversion. It is very useful for converting legacy training content available in PPT format to eLearning. All the animations and interactive buttons developed in PPT will be easily published to eLearning. Support for SCORM/AICC/xAPI. It's Easy to learn and do the job well. has all the Functionality I need to implement. It's has a bit of learning curve and UX. The Spaces and Navigation to other Section take a bit of time to get used to it. Showing content in informative way. "Greatest elearning tool for building e-courses in minutes!" iSpring suite, besides being a sophisticated, but simple solution to developing interactive elearning without any programming, is a company with a human heart. Its staff is always extremely helpful, excellent and effective. I love the way they treat you! The fact that you cannot add youtube videos in quizmaker and audio files can't be inserted in the pages in the interactiions book. However theiy are going in that direction. 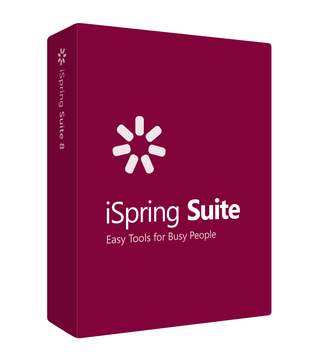 Want to have an elearning module in minutes, Ispring suite is the product you need to have! iSpring suite has become my new best friend as I can build e-courses in minutes. Please let us know if you have any questions, we'll be happy to help! Great product, great support from nice people. The support is quick, friendly and really effective. They are great communicators. Still have difficulty including quizzes. Creating e-learning without having to jump through too many hoops. Thank you tons for sharing your thoughts about iSpring here on G2Crowd! Its an easy to use, fast learning authoring platform. "Great Products & Great Support (a user of iSpring Suite and iSpring Cloud)!" I love iSpring Suite which is integrated with PowerPoint making it convenient and effective to use. I'm so glad that I found iSpring Suite. Thank you! iSpring Suite meets all of my requirements. This product helped me start my business right away! in Ispring Sute I liked most of all, that he was a Power Point widget. He diversified the work with slides. Now the presentation can include tests, dialogs and various interactivity and all this is not difficult. Not always playback in ISpring Suite corresponds to the settings that were set in Power Point slides and have to make adjustments. But this applies to more complex work with triggers in gaming. I'm a teacher. I use ISpring Suite in education. Lessons became more interesting and productive together with ISpring. In the near future I hope to start the lessons in LMS Ispring and earn money on it. 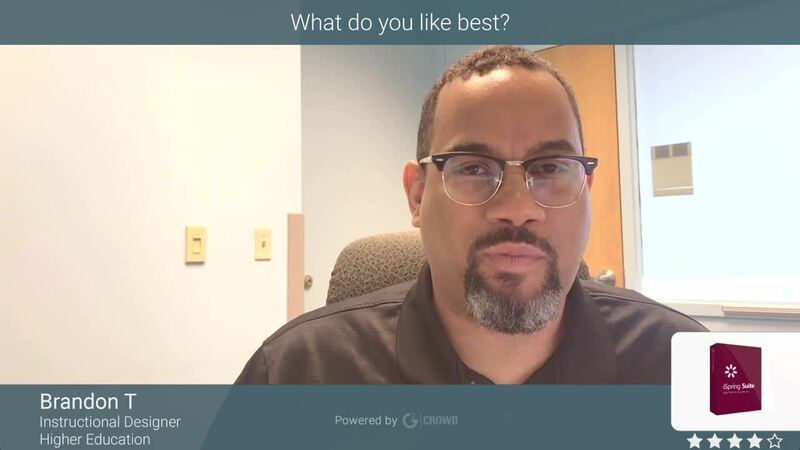 Hello and thank you greatly for sharing your positive feedback about iSpring here on G2Crowd. We are sure that it will be helpful to anyone looking for an eLearning authoring solution. if any questions come up regarding the software, please don't hesitate to send them to support@ispringsolutions.com! Great product for converting animated PPTs to view on a web format. Nothing, all good. Works very well. Converting animated PPTs to work on the sales engagement platform on iPads. "iSpring serves what we need perfectly"
"Very good experience with excellent customer support"
Thanks a lot for reviewing iSpring here on G2Crowd! We greatly appreciate it. As per the troubles when running iSpring on a virtual machine, could you please send more info to support@ispringsolutions.com. Our specialists will be glad to look into your case. Easy to get started. Tech support is sensational. Like the content library. Like the library of helpful videos. We can convert files to SCORM format to import to Saba. Hello and thank you very much for sharing your opinion about iSpring here on G2Crowd. Could you please provide a little more details regarding this comment: Service scope in terms of collaboration with other software? I am anxious to start using the RTL text functionality in the new version 9 QuizMaker and Presenter. This will greatly support my Arabic and Hebrew content needs. I have recommended this software to many LMS admins within my organization because beginners can jump right in and create content immediately, even without any previous experience. I would like to be able to actually remove the nav bar on specific slides, not just disable it. This is a fantastic content software package that is directly integrated with PowerPoint, making it easy to get up and running very quickly. The need to rapidly convert current content housed on SharePoint and load it into our organizational LMS. Thanks for reviewing iSpring here on G2Crowd. We believe your feedback will be useful to anyone looking for an eLearning solution. As per your feature request, your dedicated manager will get back to you with more details. "Very easy to deliver high-quality online training without the need for specialist developers"
No batch build capablity, making it very time-consuming to re-build dozens of lessons.